With basketball season just less than a month away, the Boston Celtics are getting back to business Tuesday. The team welcomed media Monday to its newest practice facility in Brighton during Media Day. Previously wounded teammates made appearances to show they are ready to get back into the game. "As a competitor, you know, the last thing you want to do is just to be forced onto the sideline but I think that gave some of the other guys on the team just some invaluable experience and we’re both looking excited for this year." forward Gordon Hayward said. "I can’t wait to get started." Hayward saw just five minutes of action during his Celtics debut before he broke his ankle last year. Guard Kyrie Irving sat out last year’s playoff run because of his knee surgery. 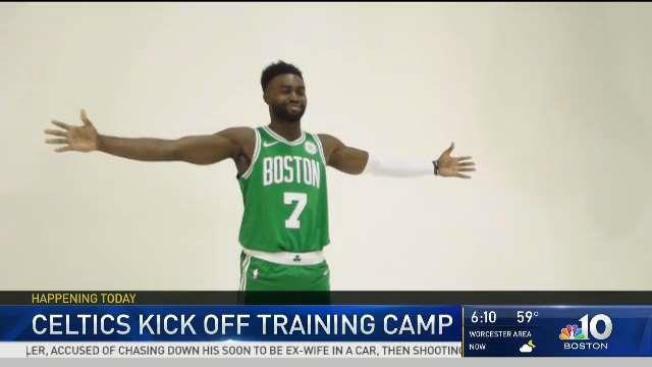 "I can't wait so, I’m looking forward to playing out there in front of the Boston fans again and being out there in front of the league," Irving said. Jayson Tatum, Jaylen Brown and Al Horford are all back this season and ready. The Celtics will open the season on Oct. 16 at home against the Philadelphia 76ers. An earlier version of this article misstated the date of the season open at home. It is on Oct. 16, not Oct. 22.